May sent Tusk a letter requesting a delay until June 30. Britain's exit from the EU is scheduled for March 29. The prime minister explained that she needed more time to convince parliamentarians to pass her deal. Tusk told reporters that her request raises legal and political questions but that he believed a short extension "will be possible." His consent hinged on a vote on May's terms of separation by the House of Commons, although it has twice rejected May's plans by an overwhelming majority. 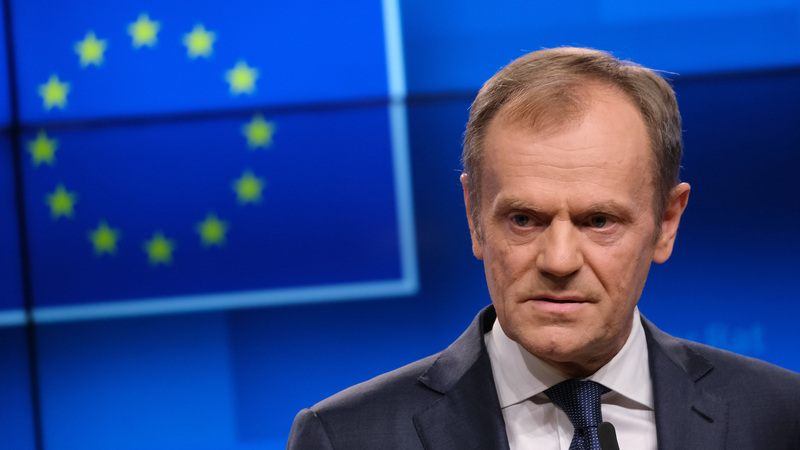 "If the leaders approve my recommendations, and if there is a positive vote in the House of Commons next week, we can finalise and formalise the decision on the extension in a written procedure," Tusk said. A press officer at the European Council who was not authorized to speak on the matter told NPR, "We've been in waiting mode for a couple of months already." He said of the proposed extension, "We are not really surprised. We're just trying to be a partner to find some solution." In February, May said that she was open to a postponed exit, but on Wednesday, she scrapped the prospect of a longer extension, dimming critics' hopes for a second referendum on whether to leave the EU. "The outcome of a long extension would be this House spending yet more endless hours contemplating its navel on Europe and failing to address the issues that matter to our constituents," she told lawmakers. "This House has indulged itself on Europe for too long." Opposition leader Jeremy Corbyn told the rowdy parliament, "Months of running down the clock and a concerted campaign of blackmail, bullying and bribery has failed to convince the House or the country that her deal is anything but a damaging national failure and should be rejected." Corbyn then asked whether May will give the people of Britain a chance to "reject the deal and change the government." Opponents of Brexit also wonder why the prime minister hasn't simply revoked Article 50, the exit clause in the EU Constitution which she triggered after the 2016 vote. At the time, May called it "an historic moment from which there can be no turning back." During a live address Wednesday night, May told the British people, "I am on your side. It is now time for [members of parliament] to decide." In her short speech, she said people were tired of "infighting" and "political games," and that parliament had done everything possible to avoid making a choice. From the lectern, she went on to say that she did not support a second referendum. "We asked you the question already and you gave us your answer." On Thursday, she will give EU leaders an update on the situation and next steps, the European Council press officer told NPR. "Then she will leave the room and other EU leaders will discuss the letter and her request to extend."